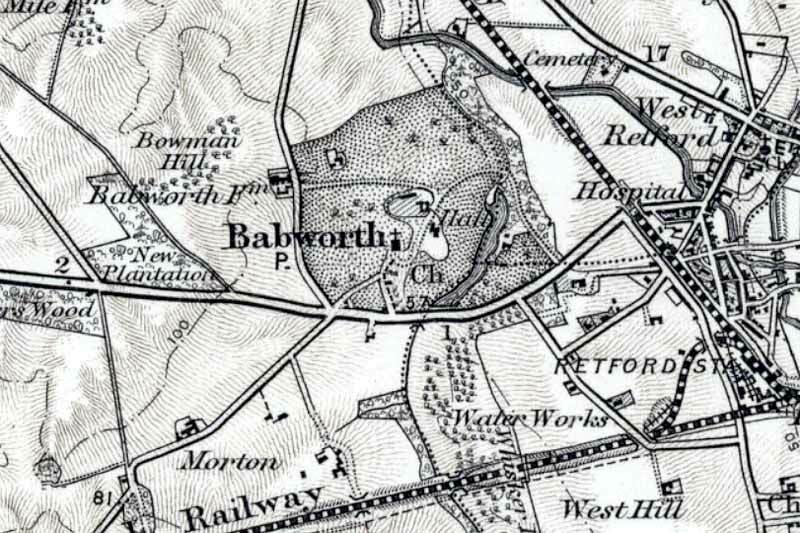 Babworth as a village is mentioned in Domesday Book, the entry reads, ‘In Babworth Wulfmaer had 2½ bovates of land to the geld. There is land for 2 ploughs. There Geoffrey, Roger’s man, has 1 plough and 1 bordar with half a plough. There is woodland pasture 2 furlongs long and 1 broad. TRE worth 40s now 10s’. Although there is no mention of a parish priest this does not mean that there was no church at this time. Previous to this time it is known that the village was held by Earl Tosti and belonged to the king’s manor of Bodmeschell. In the taxation of Pope Nicholas IV in 1291 the church was valued at £20. It is also mentioned in the 1428 subsidy (tax of Henry VI) where the taxation value is given as 40s (£2), showing that little had changed in the intervening years. It is unlikely that the church was built by the Rufford monks who held a grange in the parish in 1534. It is likely that there was a pre-existing building as it is noted that when Thomas Gunthorpe, parson of Babworth in 1518, founded Retford Grammar School he provided the site and building and its endowment came from an appropriation of chantry funds, indicating that there was a church present at that time which contained some wealth in order to be able to carry out this level of building work. Other indications of there being an earlier church are indicated in the records of Southwell Minister which shows that from 1171 until nearly the close of the 18th century the village sent 8d as its Pentecostal offering to the mother church. 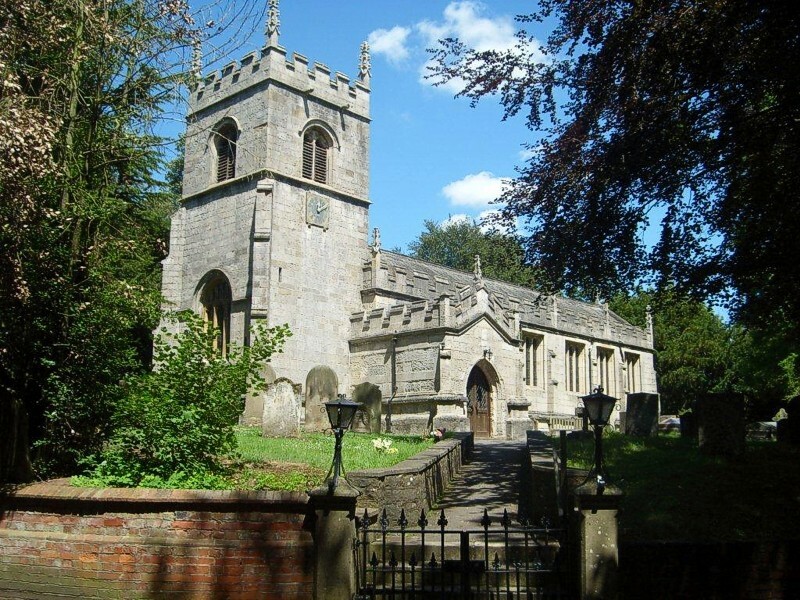 There is a record in the Babworth Historical notes 1290-1952 that the original church was built by Robert de Swillington, a Canon of Lincoln as early as 1290, but there is no indication where this information was gained from. In November 1355 Wm. Trussebut had a Licence to grant the church of Babworth in mortmain to Newstead Priory, with Licence to appropriate. This however did not take effect until 1365. Newstead priory sold the advowson of the church to John Hercy and his heirs for £15 on the eve of its suppression on 4 October 1531. There is evidence of the church from the 13th century when, in 1295, the advowson of this church was the property of Robert de Swillington, who had free warren in Babworth, and at his death, in 1365, it descended to Sir Thomas de Grendon, who, shortly afterwards sold it to Sir William Trussbutt, and his heirs, but who, within three years after taking possession, presented it to the priory of Newstead, having first obtained the king’s license, and the license of Sir Thomas de Saundby, chief and mesne lord thereof, to do so. From this period until 1531, it remained in the possession of the said priory, when John Blake, the then prior, on the 4th of October in that year, for the sum of fifteen pounds, granted it, and one acre of land, to John Hercy, Esq. of Grove, and to his heirs; nevertheless, it appears that he only made one presentation, when it passed into other hands, and in 1674 became the property of the Wortleys, from whom it was purchased by John Simpson, Esq. in whose descendants the patronage is continued. It was here the Rev Richard Clyfton preached from 1586 - he inspired the movement that eventually led to the Pilgrim Fathers and the United States of America. There is also still in existence the chalice from 1569 that had been buried under the chancel floor for 350 years and which had been used by Clyfton; also a Breeches Bible. In the visitation returns of 1603, there were no recusants shown, and an estimated population of 96 (including 2 non-communicants), with 57 of those being adults. The church was not universally popular at this time, as demonstrated in February 1607 when the rector Geo. Turvin reported that the wife of John Denman from East Retford disturbed the Easter service and she also did 'impugne the rite and ceremonie of the crosse in the sacrament of Baptisme by force and violence' contrary to the order of the Church of England, the Book of Common Prayer, the statutes of the realm of England and the ecclesiastical canons and constitutions. In 1676 the rector Charles Wilson returned that there were in the parish 71 inhabitants of an age to take the Sacrament. There were no Papists, Puritans, Quakers or anyone else who refused to take communion or absented themselves from church. By 1684 the tower was in a poor state of repair. On 26 November 1684 the churchwardens' presented that 'our steeple is very much out of repair and ready to fall down.' The following year they were complaining that they could not ring any of the bells and the steeple was still 'out of repair' in November 1688. Eventually, in 1691, the tower and 'the greater part of the edifice' was restored by, and at the sole expense of, Sir Gervase Elwes. While work was being done on the steeple foundations a large skull reported to be two feet in diameter with teeth was found. The workmen concerned are reported as having cast large stones on this skull, which was later removed, and the teeth gathered up by the local justice. No more is known about this skull or the teeth recovered. 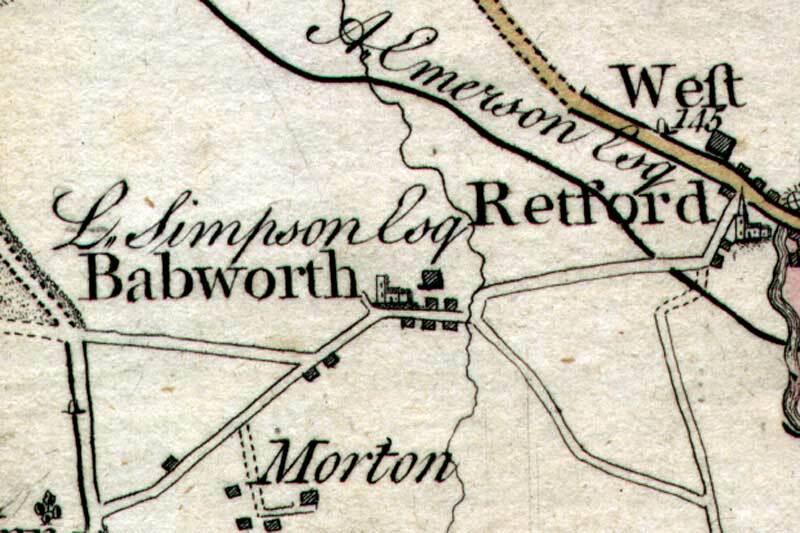 A petition to Lord Castledon asking for stone from Roche Abbey to repair the church is recorded in the Bawtry Parish Books of 1712; it cites an earlier grant to Babworth of stone from the abbey site which may relate to the work undertaken in 1691. In the entry in Archbishop Herring’s Visitation Returns, dated 10 September 1743, the incumbent Thomas Heald noted that there were 25 families including cottages, two persons were of the ‘Romish Perswasion’ (i.e. Catholics). There was no licensed or meeting house and neither was there a school, alms house, hospital or charitable endowment of any kind, but the church did have £10 for the use of the poor. The incumbent lived in the village and ministered to the parish without the aid of a curate. He conducted two services a day every Sunday and one on every Holy Day. He was also proposing to carry out another minister’s duties for a few weeks as well. At this time he noted that there were very few children in the parish (which would account for the lack of a school), who were all young, but he proposed to teach them the catechism between Lent and Whitsuntide. Of those in the parish approximately 65 were eligible to receive communion, but only between 20 and 30 did so. There were at the time 4 communion services a year. In 1764, at Archbishop Drummond’s Visitation, the incumbent was Joseph Meller who did not reside in his cure. The curate was Tomas Mottershaw who was also non-resident in the parish. There were twenty-one families in the parish, one of whom declared himself a Roman Catholic. Divine service was performed every Sunday, morning and afternoon, and Communion was administered four times a year. In 1781 Lindley Simpson gave a share in the Chesterfield Canal on which the interest was to promote for the teaching of reading in the parish. When the share was sold, the money was used to purchase bibles and prayer books for the poor. Further work was carried out on the church in 1819 and 1832 with the addition of galleries to the north wall, the first of which was thought to have been added in order to accommodate an increase in population, the second was for the private usage of the Honourable John Bridgeman. A third loft in the tower was also in use at this time and occupied by the Champion family. In the religious census of 1851, the parish was shown as covering an area of 6,165 acres, with a population of 304 males and 304 females. The church at this time had a return of 100 free spaces, other 228 and children 40, showing a total of 368. The general congregation was recorded as 112 with an additional 20 Sunday scholars, giving at total of 132. Also listed was the Ranby Licensed School Room which had been erected by John Rogers 16 years earlier with places for 120 pupils. As well as a school the building served as a chapel of ease and is shown as having a congregation of 58 in the afternoons and 24 Sunday scholars. The Babworth Church School was built in 1876 and Simpson’s bequest of 1871 was then passed onto this school. An article on the church appeared in the Nottinghamshire Guardian in March 1858. It observed that, although the exterior of the church was in a fair state of repair, the porch was 'considerably dilapidated, especially the west wall.' It also mentioned that it was planned to remove 'an unsightly gallery' under the north aisle and also that the north aisle was to be taken down and enlarged. However, an article in the paper in July 1858 stated that the restoration plans had been dramatically scaled back. The same year the London architect, John Loughborough Pearson, was brought in to restore the church. The Lincoln Diocesan Architectural Society report of 1858 approved of his plans for replacing the nave and chancel roofs with ones of a higher pitch and also recommended the building of a chancel arch. The report also requested that 'the monument now so painfully situated at the east end of the chancel, with its meretricious colouring and marvellously incongruous design, [be] removed to a less conspicuous situation.' This was the monument designed by Repton to commemorate Henrietta Frances, the wife of John Bridgeman Simpson Esq., who died in 1791. A Faculty granted by the Diocese of Lincoln on 31 July 1878, gave permission to the churchwardens ‘To restore and enlarge the church’. The work undertaken was fully described in an article on the re-opening of the church in the Nottingham Evening Post on 3 January 1879. The 'tumble down galleries' erected earlier in the 19th century were removed as were the old-fashioned high pews. The north aisle was enlarged by taking down the north wall and rebuilding it six feet from its orginal position and the porch walls were underpinned and restored. Some of the glass was removed and replaced with cathedral glazing, and the floors relaid with black and red tiles. All the plaster was removed from the walls, the 'under part of the roof' was replaced with 'open Gothic of Memel timber', an organ was installed in the church for the first time and a new window inserted into the west wall of the tower. The York-based carver and sculptor, George Walker Milburn (1844-1941), spend 628 hours producing various fixtures and fittings, including the font, pulpit, bench ends and desks. The total cost of the work was £1,715 and the architect surpervising the restoration work was again John Loughborough Pearson. There was a scandal in May 1914 when the married Rector of Babworth, the Rev H. G. C. Curtis, eloped with the wife of the local landowner, Justice of the Peace, and 'prominent churchworker', William H. Mason of Morton Hall. Curtis wrote to the Bishop of Southwell announcing his resignation from the living and also contacted a firm of auctioneers to arrange the sale of the rectory furniture. In March 1915 the Divorce Court awarded W. H. Mason a decree nisi. Curtis married Alice Mason in 1942. In 1951 the roof of the nave was overhauled, the porch roof was re-covered and the tower roof entirely renewed. Members of The General Society of Mayflower Descendants made their first pilgrimage to Babworth church in the autumn of 1955. A plaque in the porch commemorates the visit.